The Google Display Network is the new name for the “umbrella” of all the media solutions Google offers on YouTube, Google Finance, Blogger, Google Maps and Google’s Display ad partners. The Google Display Network will offer all ad formats including text, image, rich media and video ads. Advertisers will run their ads the way they always have, by placing bids or making reservations on YouTube and Google Finance. Please note that this update does not affect Google grantees directly as grantee accounts only run on our Google Search Network. For more information on the Google Display Network please check out the this website. can take the guesswork out of the equation, bringing you key trends, rich data and actionable insights. The following reports under the ‘Visitors’ tab in Google Analytics are a great place to start. Map Overlay: From countries to states and cities, this report shows from where in the world your visitors are accessing your site. The darker the shaded color on the map, the higher the concentration of visitors coming from that location. Hover your mouse over an area to quickly access the metrics associated with that geography. Best of all, you can use the tab at the top to change what metric is used for the map. Have an active goal for donations and want to see what states drive the highest donations per visitor? Interested in learning what cities drove the highest number of volunteer sign-ups after a recent event? Just swap out the metrics and get your insights in seconds. New vs. Returning: This report shows you a breakdown of your visitors into two categories - returning users (those who have been to your website before) and new users (those who have not been to your site before). You can view those two visitor groups through a variety of lenses - total visits, bounce rate, conversions and more. Diving into this report can let you know if your recent publicity efforts are paying off (do we have more ‘new’ visitors this month versus last month? ), or if you are getting larger average online donations from your returning users versus those who are looking at your site for the first time. Visitor Trending: Check these reports for a great overview of what your visitors are doing over a period of time. Do my visitors tend to spend more time browsing my site during the week, or on the weekend? Has my bounce rate changed at all since I redesigned our website? Whether you’re measuring average pageviews, bounce rate or time on site, these reports all give a high level picture of how your site is doing in relation to key metrics. The overview and insights provided by the reports above can help you make informed decisions about how to manage your Google Grants account and your website. For more information on features and reports available through Google Analytics, be sure to check out our Google Analytics Help Center. Whether it’s prospective volunteers, donors or individuals interested in your organization’s cause, better understanding your visitors and their actions on your site can help achieve your goals. Fortunately Google Analytics can take the guesswork out of the equation, bringing you key trends, rich data and actionable insights. The following reports under the ‘Visitors’ tab in Google Analytics are a great place to start. Try complementing your media campaigns with a YouTube campaign featuring any video assets from your initiative. Assets could be anything from a recorded presentation to video testimonials. There’s more to mobile fundraising than having a “text to” number. This article outlines seven ways to use mobile phones to increase donations, even if you can’t collect funds directly via mobile. Members of the non-profit community came together in Washington D.C. earlier this month to exchange their “best” failure stories and learn from the mistakes of their peers in an effort to improve future initiatives. This month’s resource round-up includes a recent example of an organization using a variety of media outlets to raise awareness and donations for their newest campaign, a small collection of upcoming non-profit events, methods for using mobile to increase donations for your organization and a new take on best practice sharing among non-profits. 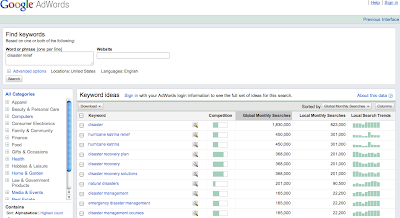 is a great resource for all things AdWords! The AdWords Online Classroom offers both on-demand and live courses that can help set you up for success. The courses cover a wide range of topics such as improving your account performance and expanding your reach. The on-demand courses are only 15-20 minutes long and the live courses last up to 60 minutes, which includes a question and answer session. Anyone with an AdWords account can sign up and attend these courses. If you would like to receive regular emails about on-demand courses and live upcoming courses, you can join the Google group. For more AdWords resources please refer to the AdWords Help Center or Google’s Business Channel on YouTube. Whether you’re a new grantee wanting to learn AdWords basics or you want to take your AdWords account to the next level, the AdWords Online Classroom is a great resource for all things AdWords! The AdWords Online Classroom offers both on-demand and live courses that can help set you up for success. As volunteers narrow down their choices online, your organization can utilize the metrics conversion tracking provides to focus your outreach efforts. You’ll be converting queries into action and connecting volunteers to your deserving organization. For details on how to implement conversion tracking please see our Help Center or watch our instructional YouTube video.
! While this site has been designed for all advertisers (not just our non-profit grantees), it can be a very valuable resource for any AdWords advertiser, including grantee organizations. This resource provides the opportunity to explore beginner, intermediate or advanced AdWords strategies and tips on writing effective ads, selecting the most relevant keywords, improving your site, tracking results, and more. When using this educational site, keep in mind the differences between your Google Grants account and a regular, paid AdWords account, as some of the tips may not apply to Grants accounts. You can find a handy list of these differences here in our Help Center. Be sure to check out this great new resource for tips to make your Google Grants account even more effective for your organization. We’re excited to share a brand-new educational resource with our grantees: the AdWords Small Business Center! While this site has been designed for all advertisers (not just our non-profit grantees), it can be a very valuable resource for any AdWords advertiser, including grantee organizations. This resource provides the opportunity to explore beginner, intermediate or advanced AdWords strategies and tips on writing effective ads, selecting the most relevant keywords, improving your site, tracking results, and more. and other Google for Non-Profit products. The event brought together non-profit grantees from across the country, with a few participants from as far away as Spain. Both large and small organizations attended the workshop, and organization focus areas included disaster relief, the environment, poverty, children’s rights, and much more. The first day of the workshop focused on maximizing your Google Grant to meet your organization’s mission and goals. Several grantees shared their experiences with AdWords, first in a case study and later in a grantee panel. Then AdWords specialists presented their expertise on account strategies and tips to the attendees, who were broken out into beginner and advanced tracks. The second day centered on additional Google for Non-Profits products and tools, including the YouTube Non-Profit program, Google Earth Outreach, and Google Apps for Non-Profits. Best practices and strategies for landing page optimization and webmaster tools were also shared. As on the first day, grantees were able to hear from their fellow non-profits on use of these tools via two case studies. Throughout the two-day workshop, our attendees were heavily engaged in learning more about Google Grants and other Google products for non-profits, and we are so glad that we were able to offer this educational session to those who could attend. For all other grantees and interested non-profits, we are pleased to announce that we will be posting the videos from the workshop, including the case studies, from which all can benefit. We hope to have these sessions live on our YouTube channel within the next several weeks and will post to this blog once those sessions are available. We will also be posting several follow-up articles to this blog, sharing strategies and advice offered at the workshop, both from Googlers and from your fellow grantees. Thanks again to all who made this workshop a success! We are especially grateful to our case study and panelist grantees who shared their firsthand experiences with the audience. We are already looking forward to the 2011 workshop. Hope to see you then! Last week, the Google Grants team hosted over 50 grantee organizations at the Google campus in Mountain View, California for a two-day workshop focused on Google Grants and other Google for Non-Profit products. The event brought together non-profit grantees from across the country, with a few participants from as far away as Spain. Both large and small organizations attended the workshop, and organization focus areas included disaster relief, the environment, poverty, children’s rights, and much more. Wonder wheel visually presents connections between related searches and your search term as an interactive diagram. This tool can be an incredibly powerful resource for creating new ad groups. 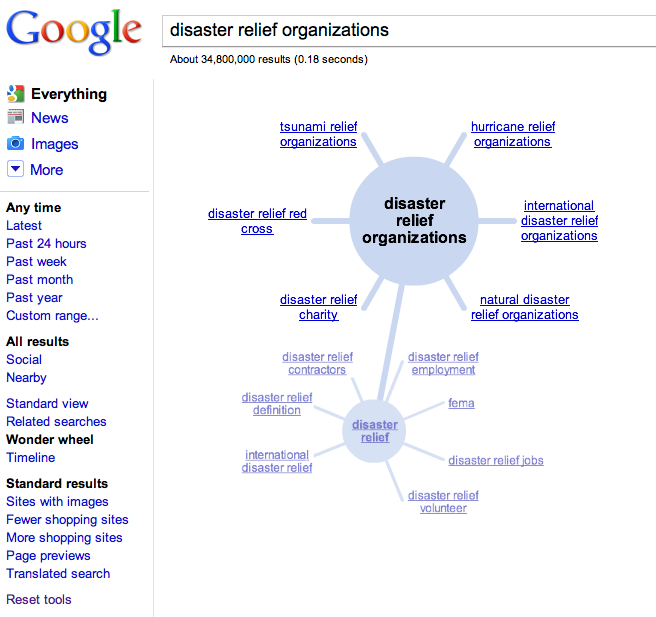 To access the tool, do a regular Google search and click ‘Show options’ at the top of the search results page. Then click ‘Wonder wheel’ under the navigation bar on the left side of the page. Although the Wonder wheel suggestions are a great guide, you know your organization best. If a logical ad group theme is missing from the suggestions, add it. If the tool suggests themes that are not relevant, don’t add them. 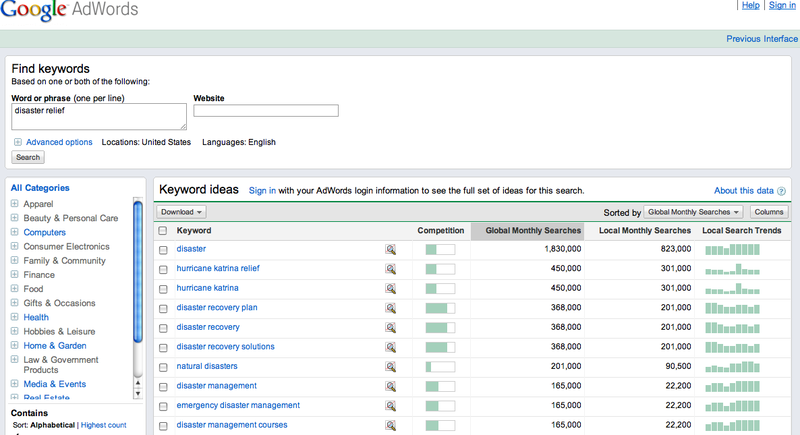 Once you have a list of new ad group themes you can use the keyword tool to identify keywords for each ad group. Input each ad group theme into the tool and select ‘Search’ and then sort by ‘Global Monthly Searches’ to refine the list to those with the most search traffic. For more information on optimizing your campaign check back for our monthly tips and refer to the AdWords Help Center. Looking for new ad group themes? If so, check out our Wonder wheel tool that can be found within Google Search Options. 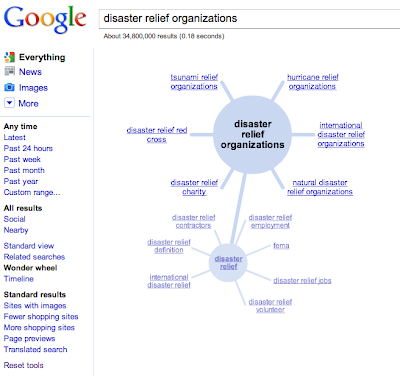 Wonder wheel visually presents connections between related searches and your search term as an interactive diagram. This tool can be an incredibly powerful resource for creating new ad groups.